The Republic of Khakassia is situated in the southern part of Eastern Siberia having an area of 633 km2. The state borders the region of Kemerovo in the northwest, the Republic Altai and the Republic Tuva in the south and the southwest, thus including the valleys of the Abakan and the Minusinsk Basin at the upper Yenisei River as well as a part of the Chulym-Yenisei valley. The Kuznetsk Alatau mountain range serves as a western border to Kemerovo. The southern border shared with the Republics of Altai and Tuva extends along the western Sayan-Altai mountain range. The Dzhebashsky mountains and the Yenisei represent the border to the East. The only border without a clearly defined natural frontier is the border to the north with the region Krasnojarsk and the woods and forests thereof claiming a wide and open territory of the Chulym-Yenisei valley. The landscape is marked by a continental climate showing cold winters and hot summers. There are existent more than 230 bigger and smaller rivers and nearly 300 mountain and steppe lakes with saline and fresh water, with the Lake Shira with its healing waters being one thereof. The region is rich in mineral resources, and so far an important timber industry, wheat farming, cattle breeding and other agricultural productions have been established. - The name "Khakassia" refers to the people settling here, the Khakas. These have their origins with the Tatars, they call themselves "Tadars" or later "Khaas", which is to be translated as “human being”. The Khakas originally stem from the tribes of the Kets and the Nenets people, who were dominated by Turkic speaking authorities. Following the Mongol invasion in the 13th century, they have adopted Mongolian elements. It was only in the 19th century that Turkic elements were integrated as well. The emigrated Kirghiz left behind a rich culture as well as an old runic writing (Yenisei), and the Orkhon Runes, dating back to the 8th century AD. Therein, the bloody war with the Göktürks, in the course of which the generally acclaimed Kirghiz ruler Bars Beg was killed (711/12), is described in a rather elaborate and illustrative way. Rock drawings, tombs, ritual sites as well as Deer Stones tell us about the past days and of peoples who have settled here since the 3rd century AD. - from the 6th to the 13th century settlement of the Kets (Khanty people) and the Nents (Samoyedic people), who belong to the tribes of the Ural group and speak a Finno-Ugric language. They formed tribal associations and, for a long time, were subjected to different Turkic tribal confederations (Dzungars, Oirat alliance), among other, also by the Kirghiz and a Manchu-Chinese Quing dynasty. - 1207  first Mongolian conquest. - 16th century  formation of the regions of the four Khakas tribal princes. - 17th century  immigration of the first Russian settlers. - 1721  Russian conquest. The Nents have their origins in the Altai-Sajan Mountains and mixed, upon migration along the Ob downwards, with the fishermen and hunters settling there. They still live as hunters along the Arctic coast in the East and the West of the Ural Mountains. The Nents are endangered by the exploitation of the huge oil and natural gas resources, a phenomenon promoting the large-scale destruction of the reindeer grazing areas. They belong to the Samoyedic people, a Finno-Ugric language group. The Kets  (“human being“), Yenisei Ostyaks. A nomadic people in Siberia, related with the Khanty people, who settled in the territory between Ob, upper Irtysch and Yenisei. They were hunters, fishermen and reindeer breeders. Their language is part of the Finno-Ugric language group. 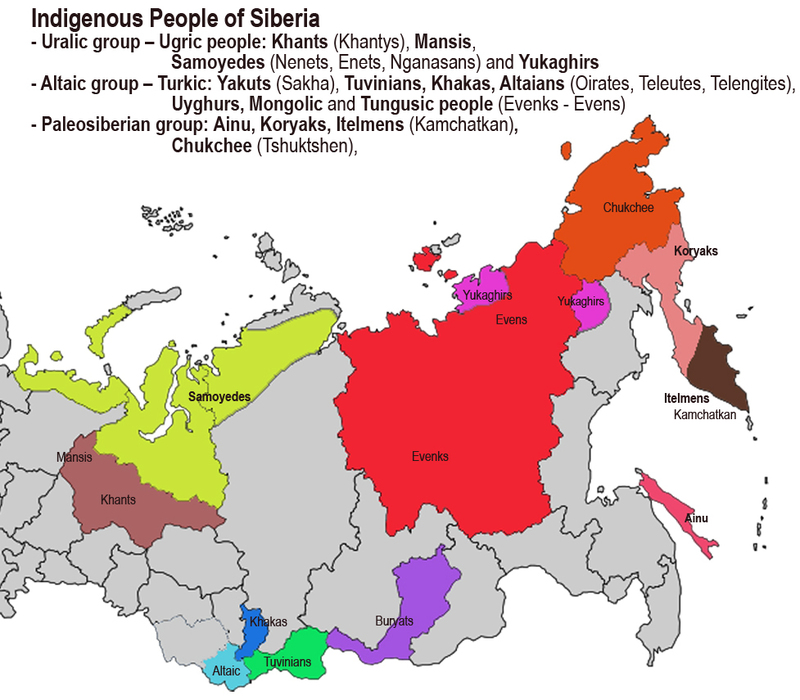  more information on the indigenous people in Siberia. Relatively favourable climatic conditions in the Minusinsk Basin, protected by the high mountains surrounding the areas, have rather early attracted people to settle in this region from the Early Stone Age on. During the last thousand years, there has continuously lived here a variety of populations, the cultures of which  as archaeological findings have proven  have shown their influences here, starting at the Late Neolithic Age  with a still intensively discussed Tazim culture (approximately 2000 to 2500 BC). These were followed by archaeological epochs: Afanasevo, Okunevo, Andronovo and Karasuk culture. Semi-nomads were farmers and cattle breeders with alpine farming. They were increasingly dominated by immigrating strong steppe nomads. As the development of the later Bronze Age with the Tagar culture (700 to 200 BC) showed, they were closely associated with and influenced by a Scythian era with Animal Style, which left its marks in the history of the entire Central and Eurasian area. Due to palaeo-anthropological data, this Tagar culture seems to have mixed with local indigenous cultures by way of immigration of predominantly Euripides. This was followed by the Tashtyk culture (Hun tribe  200 BC to 200 AD), corresponding to a period that was marked by the Huns, accompanied by the invasion of a new Mongoloid population with Turkic speaking tribes into the Minusinsk Basin. This may well be considered the beginning of the formation of a modern Khakas population, although it is rather obvious that all earlier periods have left behind their genetic as well as culturual footprints. Alternating tribal alliances between the sixth and the 17th century made the region a rather instable one, which was finally integrated by way of the Mongolian expansion tendencies under Genghis Khan in the 13th century into his empire. The largest expansion in territorial terms was marked by the victory of the Kirghiz over Uighur Kaghanate in 840 AD, when they conquered large areas up to Tian Shan and maintained their supremacy over this territory for the 200 years to follow. The Kirghiz supremacy of the Sayan-Altai region decreased as a result of the increasing Mongolian expansion. With the rise of the Mongol Empire in the 13th century, the Kirghiz-dominated south was occupied without any resistance following the foundation of the Yekhe Mongol Ulus (Mongolian Empires) under Genghis Khan’s oldest son Jochi. They remained Mongolian vassals until the late 14th century. Various Turkic peoples ruled until 1865, when they were finally conquered by the Kalmyk people (Oirat alliance, Dzungars). The Kirghiz people emigrated wave-like. Finally, the Russian conquest further contributed to their fleeing their home country, thus laying the foundations for the establishment of the modern Kirghizstan at the bottom of the Tian Shan. The majority of researchers has come to believe that the ancestors of the southern Kirghiz tribes might have had their origins in the old tribal communities of the Sakha people (Yakuts), the Saka people (Scythians) and Usun, the Dingling and the Huns (Tashtyk). The Usun nomads lived in the times of the Saka people. A rather intense inter-action between the Saka people and the Usun in southern Kazakhstan and with the people living in the regions of Xinjiang and the Tian Shan is clearly visible. The tombs of the Usun elite in the Tian Shan Mountains and of those situated in Xinjiang in China are similar to those of the Saka people. Tuva  Tannu-Tuva was an independent state from 1921 to 1944, situated in Central Asia between Mongolia and Russia. The history of Tannu-Tuva (or Tuva, as it is nowadays called) is a rather varied and diversified one. In 1207 the territory was conquered by Genghis Khan and subsequently ruled by the Yuan dynasty. Later on, the rulers of Tuva were, among others, Mongols and Kirghiz, until in 1757 it was integrated into the Manchu-Chinese Empire. In 1911, in the course of the Chinese Revolution, there was realized the secession of Outer Mongolia, including then Tuva. In 1914 the Russian Tsar expanded his power and included Tuva as a protectorate. Sakha  The immigration of the Yakuts into the valley of the river Lena constitutes one of the last migrations of the Turkic tribes from Central Asia taking place. In contrast to all other Turkic tribes, the Yakuts did not follow the southern or western routes but rather migrated to the northeast. Their migration started in the 12th century, from the southern region of the Lake Baikal towards north, at a point of time when the Mongols were expanding their power beyond the Altai (1). Their original settlements were supposedly to be found at the Upper Yenisei, as their handicraft style showed many similarities with that of those tribes.  (1) Russian researchers believe they were the Quryqan (Ruan Ruan  Juan Juan), who resided west and south of Lake Baikal, who were referred to as “Ku-li-kann” in Chinese sources, a Turkic people who lived north of the Eastern-Turkish Kingdom from the 6th to the 9th centuries AD and whose name appears in the Orkhon runes of the 8th century AD as well. Russian scientists believe that by extending their area of power in the early 9th century, the majority of the Quryqan were forced to move north. This sudden emigration is proven by burial objects. A smaller part stayed in the country, being subject to a first Mongolization by the Kitan (2), and was incorporated by the Buryats after their invasion.  (2) Kitan or Khitan: a Protomongolian people from Manchuria that existed as early as the 6th century AD. Dingling: They originally lived at the upper part of the river Lena, in the West of Lake Baikal. In the 3rd century BC they started to expand towards the west. They represented a part of the empire of the Xiongnu. Apart from Turkic people, there also lived in this region also groups pertaining to a different language group. Indeed, the Turkic language has never been permanently present in the eastern half of the Minusinsk Basin. Settlers rather used the language of the Uralic group of the southern area of the upper Yenisei territory, with the Kets belonging to the Yenisei family and being related with the Khanty people. The Nents people at the Ob belong to the Uighur-Oghuz family and to the Samoyedes people. These were small communities with a Finno-Ugric language. These indigenous ethno-linguistic groups vanished due the assimilation of the Yenisei Kirghiz (Khakas people) by the Russian people. Their influence, however, is still visible but rather only in connection with family names and place names. The Yenisei Kirghiz - Xiajiasi (as described in Chinese chronicles, or the Xiajia, those having a “yellow head and a red face”, as they were called by the Uighurs.) are an old people who settled at the upper part of the Yenisei and in the valleys of the tributary rivers of the river Abakan and in the Minusinsk Basin between the 3rd century BC and the 9th century AD. In the 6th century they were subjugated by the tribes of the Göktürks, the Xueyantuo and the Uighurs during the Han period. The peoples were identified as Turkic and may be associated with the Dingling, Ruan Ruan and the Shors, the ancestors of the Uighurs. These Jiankun or Gekun (later on called Kirghiz), as well as the Xinli and probably also the Hujie or Wujie, were tribes who settled in the north and in the west adjoining the Xiongnu tribes, with the Kirghiz establishing themselves in the beginning of the Tang dynasty as an independent large empire. Comparable pre-historical findings, as have been found in the area around Lake Baikal, may probably be associated with the ancestors of the Yakuts, the Quryqan, who settled in the Altai area at the same time as the Xiongnu. These were real masters in the processing of arms and weaponry. The tribes of the Khaas live in the central part of today’s Khakassia, the Khyzyl in the northwest, the Saghai and the Piltîr in the southwest, and the Khoibal in the southeast: their language has been assigned to various related dialects, and their designations go back to various regional clans. They call themselves Tatars (Tadar) or Shors and later on Khakas (Khaas). In the southwest of Khakassia and in Kemerovo region live the Shors (the origin of the Shoria, a dialect that is still spoken in the Kemerovo region). In a historical, linguistic and partly cultural sense, the Khakas may be divided into three ethnical groups  the Shors (in the north), the Chulym Turks and the Manchurian Kirghiz. A legend tells of dark-haired people living amongst the successors of the Kirghiz, as has been found recorded in Xiongnu. This description of the Kirghiz as being tall, blond and blue-eyed made many believe that their original language was as Germanic, Slavic language of an Ostyak people or of Samoyed origin. Proof of the language of the Kirghiz in Tang sources shows that they have never been within the scope of the Turkic linguistic area and, hence, there is not present any evidence of their earlier language. The Turkic people in Khakassia and the Altai region were hunters and nomad herdsmen taking care of their sheep, horses and sometimes camels. They bequeathed to their successors an extremely interesting culture, the basic features and characteristics of which still being transported from one generation to the next one from the earliest times on until now. One of the most important art forms of the Khakas and the Altai people is the telling of stories (epics) in a falsetto voice, accompanied by the two-chord khomys (topshur). In Khakassia, these epics were predominantly accompanied by the chatkhan (jadaghan  box zither) and rarely also by the yykh (ikili). The texts were usually sung in a low drone bass, as is usually used by overtone singers khaijy (kaichi). In the long nights, the community was entertained with songs, also often accompanied by instruments to keep them awake or to tell them about life and the cosmological importance thereof. The souls of the deceased were supported; they were accompanied on their way to the woods (realm of the death). The Khakas belong to a Turkic speaking people who settle in today’s south Siberia in the Autonomous Republic of Khakassia at the upper Yenisei, surrounded by other Turkic speaking peoples in the East, by the Tuvinian towards the Sayan Mountains, and in the west towards the Altai mountain range by the Altai people. In the north towards Kemerovo, there have settled Tatars immigrated from the Crimean region, and the region around Krasnojarsk is mainly inhabited by a Slavic population. The Khakas settle in mountain valleys, at tributary rivers of the Abakan in the Taiga and in the partly wide open steppes at the Upper Yenisei as well as in the Minusinsk Basin. The population mainly lives as nomads with alpine farming in summer and winter grazing areas and cattle breeding. In their shamanistic tradition there is a pantheon having assisting spirits (tös), of which each is represented in a canonic form as a small idol (amulet). These idols are intended to protect their holders against illness and diseases and other problems. Shamans celebrate the communication with supernatural powers in the way of everyday practices as well as on special occasions. Invoking the gods is realized by reciting in personal as well as a community and short praises or inquiries to the “holder” of the nature spirits (eeler) or mountain spirits (tagh eezî). There is used a variety of animal sounds when asking the animal spirits for help in order to manipulate the spirits  fortune telling, cleansing, healing and also witchcraft have always been performed by specialists. Alashy (ritual cleaner) are persons who celebrate these rites using burning mountain thyme (irben ot) uttering spells. This method of cleansing is still in use nowadays. Another specialist (imchî - healer) is often consulted, who tries to prevent illness by means of personal articles as wooden cups, spoons, a scarf or wooden figures in order to enclose such spirits therein. Sybyraghjy are witches that may cause bad luck during a recitation by throwing dirty objects. A shaman (kham) was asked for help in the case of catastrophes, in the night as well as during the day, within and outside of the house, but also outside of settlements. The shaman celebrated his rites by way of using his voice (spells or prayers) or with the aid of his assistants (helping spirits), thereby being included whistling, shouting, moaning, crying using animal imitations in order to attract the spirits, but also reciting texts or singing songs. The khams also used a drum, the frame drum tüür (lit. skin) and the jew’s harp (timîr-khomys). The drum is often associated with male power, whereas the jew’s harp is associated with female power. The Khakas distinguish between several forms of the soul; khut; life power, tyn; breath, chula; the fire of the eyes, which leave the body in the night and travel around. The technique of healing ill persons is realized by calling back the soul that has left the body or the spirit that burdens the soul, into an object such as a carved wooden figure. khaghba, a kind of protecting aura, is positioned onto the right shoulder of a man. A shaman may rely on the myghyra, the help granted by the clan’s tree. The trunks of these trees own a place of power on which a holy tree is situated. It is strictly prohibited to fell these trees or take wood or branches therefrom without having asked. Life power khut is supposedly also included in hair. Women protect their lungs, their breath (tyn), wearing a pogho (1) or a ritual amulet, usually a necklace embroidered with pearls. Other regions of the body, which are also ritually protected, are the upper side of the head (the region of the truth (syn) and the third eye. With men, a special belt is intended to protect the third chakra. (1) Pogho  Women hold an important place in the Khakas society, which is reflected in many heroic poems and epics. Female warriors have been great heroes against external enemies. Women wear a "pogho", a female breast ornament made of cowry shells, pearl buttons and colourful beads sewn to leather or textile, and how they live is explained in specific tales, where the rules are described in ornamental form. The poghos build a bridge between generations and function at the same time as a spiritual protective shield that protects female fertility and thus secures offspring (animist thinking) against external enemies. Such shaman sessions have been revived: the beating of the drums in accompaniment by deep voice for reciting, and with the aid of an assistant in order to call the spirits and ask for their help. Burkhanism is the belief in heaven deities (rulers of the upper world) and saviours of the peoples of paradise. The story refers to an old legend about a sleeping warrior of the past. In the 16th century, a great hero fought against the Mongols and afterwards went to the mountains to find his sleep. It is possible to recognize his form when driving along the road from Abakan to Kyzyl. This legend tells that he will be brought back to life in order to save mankind. Therein, there are included the wish for freedom in the case of subjugation by invading tribes. There have been found ornaments with curved lines and floral design. Similar patterns may also be found with neighbouring peoples of the Sayan Altai region and the Yakuts (Sakha) then settling there. Of course, there are existent different examples among the cultures of the Khakas and their neighbouring peoples. Unfortunately, however, this ornamentation has been substituted for Buddhist forms, so that their originality and meaning and importance have vanished. The Khakas know a form of reciting songs by way of overtone singing, just like the Tuvin and the Altai people and the western Mongols. Singing is accompanied by a chord instrument, with heroic lyrics, fairytales and general sayings being presented. The jew’s harp was mainly played by female shamans. In the Altai and in the Tuva area, playing this harp form was indeed mostly associated with female power, as its most important aim was the imitation of sounds in a natural surrounding and the communication with the spirits. The oral transmission of their tradition vanished with the Russification and the death of the old masters. Clan meetings, ceremonies and shaman sessions were prohibited, as well as other ritual performances at holy sites. The presentation of epic texts with a belief in a spiritual power and their religious as well as ethnical importance ceased to be permitted. The taboos of Siberian peoples got lost, such as rite-like performances as moving towards the sun or circumventing holy places and sites clock-wise. If you walk in the opposite direction towards the forest, this is walking towards death. If a snake crosses your way, you have to turn into the other direction. The Mongolian people determine their most favourable travel dates in accordance with the calendar. If, however, starting towards the south is dangerous, you will start towards the west and then make a turn and assume your way to the south. If a fox crosses your path in front of the house, you must immediately turn around. If the fox enters the house, you may continue your way. Clan meetings with rites and ancestor cults at certain holy places were important within the communities and families: these are called üstegei, sites that are connected with power. Shamans know more than 200 such sites intended for rites. Such sites may be found in the mountains, the home of the spirits which have served as assisting spirits of the shamans in the past. In epic stories and in history, mountains are seen as a meeting point between heaven and earth. They represent a connection with the upper world. People have always attempted to copy the sounds of nature and work. Hunters and herdsmen used the sounds of the animals to call or attract them, using different flutes or pipes. Among these are this straw whistle (syghyrtkhy), a small birch whistle (sybyskhy) and the large conical wooden sucked trumpet (pyrghy). This trumpet was also used for the opening ceremony of clan meetings or for signalling. Invocations and prayers (alghys) for the spirits, holy mountains and places, to appease the spirits, thanking prayers for a successful harvest or hunt, blessings for the community and of the children as well as spells have nearly vanished completely. Songs were performed for courtship or for dances at weddings, in the case of solstice. Dance songs were performed on the occasion of meetings (herein, movement and mimic are of great importance). Round dances were only performed by the Buryats and the Evenks. Songs in the recitative of khaijy (kaichi), presented improvisations; ritual and ceremonial songs; lullabies, lamentations (lamenti), true stories or epic legends (nymakh). In his performance the artist was given a gift by the “spirit”, literally the “holder”, he received inspiration. Certain songs were sung when riding through the steppe or the Taiga or when walking, often accompanied by the lute or the board zither. But it was, however, prohibited by the Khakas people, as this was considered dangerous. When Mongols met in the round tent, they often told how many “long songs” they had sat through on their horse. The Khakas people have no "long songs". Singing was usually permitted in the house and around the house, and  as long as it was taking place in groups. Songs were performed at meetings, festivities, and seasons and on special ceremonies. The people were allowed to sing night and day, all around the world inhabited by people. It was, however, prohibited to sing in the Taiga, as this was considered dangerous. Different songs having determined texts were intended for everyday situations, family festivities, competitions and contests as wells as weddings. The songs could be performed solo, alternating between two people in a dialogue, in two groups or accompanied by a choir. The texts were controlled by strict rules regarding weddings (courtship etc.) or for games. Improvised texts were performed in the course of competitions and contests. In Central Asia, such contests were rather popular in the course of meetings. These are still alive today: horse races, wrestling, arching  with songs and presentations. In such organized aitys (singing contest) also the improvised singing (takhpakh) was rather popular. Here, the artists could show their talents in the form of a singing competition with improvised texts, thus establishing their position within the community. Apart from poetic recitations, the focus was also on ingenuity, with and often musical accompaniment. Singers with a certain level of quick wittedness became regional masters. Such singers khaijy (kaichi = bards), experienced a similar position to that of a shaman. Stories presented by overtone singing, tell of their ancestors, heroes and leaders. Young singers were exclusively introduced by masters  as it is the case with shamans. Talents were promoted already in childhood. Such inter-tribal contests promoted the exchange of orally transmitted contents, thus also preserving the native songs alghyschy (folk singers). In legends, there is told of the survival of the tribes, of rebirth, of life after death, initiation into adulthood, about male and female energies, the respect of nature and home. The telling of stories was also associated with medicine, such as it is the case in other cultures. Young professional musicians only are aware of this old knowledge in regard to text and sound in pure fragments. Russified thought concepts rather impeded an original understanding. In the last years, however, the musicians have started to approach and accept this knowledge, carefully studying and entering discussions with the old masters. They have become involved in the historical, ethnographical and philosophical traditions of a “traditional” culture, art and religion, ceasing to be satisfied with the patterns of this Soviet-based reconstructed “folk music”. They have started to explore their musical and spiritual “roots”, an objectively oriented approach, by means of which their music is intended to revive their philosophical-cosmological concept. Artists have now revived these traditions, searching for authentic patterns of their ancestors: in the performing arts, in theatre, in ceremonial practices, shamanism and their musical heritage when presenting praise songs. In connection with the then world concept of animism and the tales of origin and suffering, there are presented heroic legends (epics)  with overtone singing, with a lute or the box zither, the holy instrument. Such songs are nowadays used and also presented by women on evening meetings, long winter nights, for death watches and before hunts. Bronze Age  to 1200 BC.